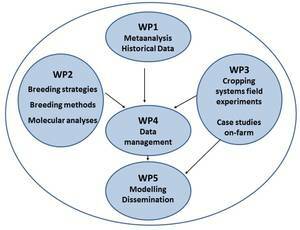 In WP1, the efficiency of historical and recent breeding activities for cropping systems with different level of productivity is assessed, based on evaluation of VCU and variety testings in Germany over a longer period and a meta-analysis of published studies on breeding progress. In WP2, the performance of differently adapted populations and genotypes of different morphological type in cropping systems with different levels of input and biodiversity are investigated. Focus in WP2 is the performance of the system, not ecological impacts.Populations with different histories are available: from single environments and that have gone through many environments. In WP3 the performance of differently adapted populations and genotypes will be assessed in field experiments in established cropping systems (medium-term-experiments and selected farms). Material and energetic fluxes, as well as indicators for sustainability will be analyzed in detail. Focus of this WP are performance and ecological impact. Data for the socio-economic and ecological impact analysis will be provided to WP5. WP4 comprises design and implementation of databases and data management, making available the results of Wps 1-3 for the joint analysis planned for WP 5, but also beyond the end of this project. In WP5, the results of all WPs will be evaluated for the socio-economic and ecological impact. In addition, scenarios will be calculated/simulated on rotation, farm and regional levels. Inputs will be differentiated based on fossil fuel based inputs and others. The WP also comprises dissemination of the results into practical agriculture and an analysis of political-administrative aspects, especially legal hurdles for the establishment of LI- and HD- Varieties. These will be discussed with the wider breeding community in a workshop.